This month for my husband’s work cake I received an e-mail from a co-worker of his asking for a special request. Some of their student workers had spent spring break in Guatemala picking coffee beans, helping build a school, and other projects, so she was wondering if I could make a coffee themed cake. Of course I jumped at the chance to do this because I love coffee! 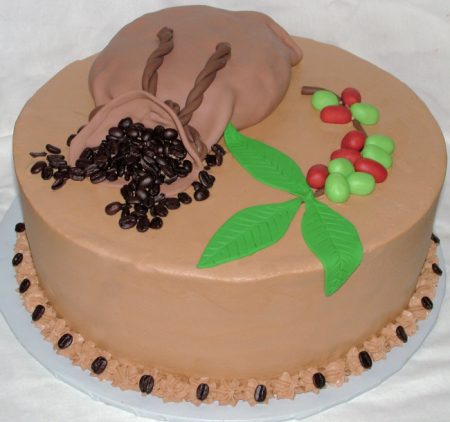 So this cake is a 12″ round cake with coffee flavored icing (one of my favorites!). They all loved it! 🙂 The plant on the right is what a coffee berries look like when you see them on the plant.